Manufactured in the US by Arizona Capacitors, now part of Electro Technik Industries, the C50309 range of paper and polyester dielectric, oil-filled capacitors is designed for use in audio equipment such as pre-amplifiers, amplifiers and loudspeaker crossover networks. Using well proven, traditional high quality materials and techniques, these capacitors are designed for high performance and long life and feature the finest capacitor grade kraft paper and polyester available. Components in the range are rated for operation at 600V DC and standard capacitance tolerance is +/-10%. Insulation resistance is quoted at 6000 megohm-microfarads minimum, while the dissipation factor is less than 1% measured at 120Hz. 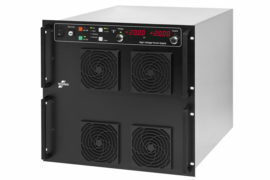 The operating temperature covers the full military range from -55 to 125oC at full rated voltage. A typical capacitor in the range is the C50309-6224K offering a capacitance of 0.22µF +/-10%. The hermetically-sealed tubular brass case diameter is 17mm, and overall length is 47.6mm. The 20awg leads are solder-coated oxygen free solid copper. This is just one of a range of capacitor designs specifically aimed at the high end audio market. These capacitors are ideal for high end crossover circuits and filter applications in amplifiers, pre-amplifiers and power supplies, plus other specialist, high quality audio equipment. Of interest to those audio experts looking for that vintage sound, Arizona Capacitors started life as West Cap of Arizona, a company that has been making capacitors in Tucson since 1952. It moved into its current larger, more modern,Tucson facility in March 2012, and has continued its tradition of making high grade capacitors.